If you enjoy photography, don't make the mistake I did. Using my then-new SLR in 2005 and 2006, I photographed everything from my new son to otherworldly canyons we visited in Utah. The only problem: the photos were taken only in JPEG format. JPEG is fine as far as it goes, and indeed for most folks it will suffice. But having rediscovered my enjoyment of photography in the digital era, I wish I'd used the raw image format that comes with SLRs and higher-end compact cameras. My initial regret was from the realization that raw photos, although taking up about three times the storage space as a JPEG and requiring manual processing, offer higher quality and more flexibility. But what I've come to understand since then is a second advantage of raw: because processing software improves over time, raw photos in effect can get better with age. For that reason, I've begun recommending friends who show some enthusiasm for photography that they should think about shooting important events in raw format alongside JPEG. You don't have to mess with the raw files today, but if it's an important event like a wedding, you might want them for later. I've included below some samples of a noisy image shot in near-darkness at ISO 25,600 from my SLR. They may not convince you that shooting raw is a miracle cure for photo quality, but they do illustrate some differences with the camera's JPEG and that the raw-processing software isn't standing still. Raw? What's that mean anyway? But first, a little background. What exactly are raw images? A digital camera's image sensor is a grid of pixels that captures light from a scene. Cameras can interpret this image, processing it in various ways to produce a JPEG. A raw file, though, is the unprocessed data from the image sensor. However, there's no raw standard; each digital camera has its own, usually proprietary, raw format, though they're sometimes related. Although cameras can produce JPEGs, a subset of the image-editing industry serves those who shoot raw. Options include Adobe Systems' Photoshop and Photoshop Lightroom, Apple's Aperture, DxO Labs' Optics Pro, Phase One's Capture One, and a handful of others. The variety of proprietary formats means these applications must be constantly updated for the newest cameras. All SLRs can produce raw images, as can a variety of higher-end compact cameras such as Panasonic's LX3 and GF1, Canon's S90 and G11, and Olympus' E-P1 and E-P2. Raw files vary from JPEG in several ways. Here are some of the nitty-gritty details. Let's start at the individual pixel. Each one you see on a computer screen has a mixture of three colors of light: red, green, and blue. But with most cameras' image sensors, each pixel captures only one of those colors. 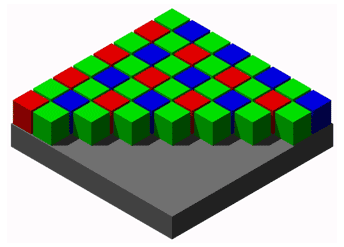 A process called demosaicing converts this checkerboard-like arrangement of colors, called a Bayer pattern, so each pixel in the final image gets all three colors instead of just one. Another difference is in white balance. Unlike film cameras of yore, digital cameras can make a snap judgment whether a shot is being taken under yellowish incandescent light, under white sunlight, or in bluish shade, then try to correct the image so white looks white. This processing change is baked into a JPEG image, but it's just a recommendation in a raw shot. Finally, each color in a JPEG pixel is stored with an 8-bit value, providing 256 steps between, the darkest and lightest green, red, or blue. With raw, most cameras today record 12 or 14 bits per color, providing 8,192 or 16,384 levels, respectively. What does raw get you? The big drawbacks of raw images are that the files are larger and that you can't share them easily until you've edited them with some kind of software. But here are some of the first advantages I found shooting raw. Some professionals with lots of experience and time to set up shots get everything right. For the rest of us, shots often are overexposed or underexposed. One of the main advantages of shooting raw is better flexibility to correct such problems—in part because of that better color depth than JPEG affords. "Shooting in raw is usually more forgiving than just shooting jpeg files, so should you make a mistake when capturing an image you have a better opportunity with a RAW file to go back and correct any mistakes," said Richard Pelkowski, product manager of digital SLRs for Olympus Imaging America. "We typically encourage our Olympus consumers to shoot in both raw plus JPEG mode so they immediately have both a JPEG file you can easily share and use instantly and a more forgiving raw file that you can go back to later for post processing." Take the example of Jonathan Machen, an artist I know in Boulder, Colo., who embraced raw as he moved from point-and-shoot cameras to an SLR. "While I strive to understand my camera completely and hope to take images that approximate the balance of light that my eye sees, it's not always possible, especially in fast-moving family situations. I love to take pictures of the kids in unusual lighting and compositional situations, but it can be a distracting combination trying to watch them and trying to take a good picture," he said. Case in point: at dinner in a restaurant recently, a kid-friendly lap dog appeared, but Machen's camera was set wrong. "I got the shot, but the image was almost black," he said. "Later, editing the raw file, I brought it back to a place that brought a smile to my face as well as that of my wife." Even if you don't make mistakes, raw images offer more flexibility in editing to bring out details otherwise lost in murky shadows or bright highlights. This is the particular ability I wish I had for shots of my newborn son held under bright heat lamps and of a twisty narrow canyon in both sun and shade. Adjustable white balance is another nicety. On many occasions I've fixed the colors of conference speakers whose faces were turned to yellow putty by stage lights or of a friend's darling daughter whose position in the shade made her look like an ice queen in the making. Computers also get more power to compensate for lens shortcomings or reduce the sensor noise that speckles images, said Cyrille de la Chesnais, director of sales and marketing for photography at the Paris-based DxO Labs. "Optical corrections and noise removal are much more precise and effective on raw files than on JPEG files," he said. Many cameras let you adjust noise reduction levels when you take the photo—but again, with a JPEG, your choice is baked permanently into the image. Here's where I hadn't appreciated raw's advantages: computers get faster. Demosaicing is a complicated process that benefits from more computing horsepower, and unlike many computing tasks, it happens to be one that can easily benefit from multicore processors. When you take a photo with your camera, it uses a relatively feeble image-processing chip to produce the JPEG. It's remarkable to me how well those chips can perform the task, but even with the best quality on the market today, your camera will only have one chance to make that JPEG. But if you're converting a raw image with software, you not only get more computing horsepower than a camera offers, you get algorithms that are updated. "You can revisit this digital negative and reprocess it as technology improves," said Tom Hogarty, Adobe's product manager for Lightroom. Hogarty likens the situation to what he saw looking at prints in a museum by the famed landscape photographer Ansel Adams. "You could tell the earlier prints didn't stand out. They didn't have same kind of depth that the later prints did. The printing technology and chemicals were getting better," Hogarty said. "Imagine if all you had was original print and you couldn't improve it going forward." DxO Optics Pro 6, released in November, and the beta version of Lightroom 3, introduced in October, both are designed to extract a better image from the raw data. De la Chesnais said DxO Optics Pro improves noise reduction so that one F-stop's worth of noise can be fixed. That means that if you previously were happy shooting photos at ISO 800, you could push your camera to ISO 1600 for better low-light performance, for example. Noise reduction is a complicated problem. In addition to getting rid of the color and brightness variations from pixel to pixel, lower-frequency noise patterns often lead to blotches of red or blue that span many pixels. Good noise reduction preserves original colors and fine details and doesn't give the image a smeary watercolor-painting look up close. Another software matter: software can take its best guess what sort of editing settings to apply. In my experience, that's a good starting point if not always a good final result, but I expect improvements here, too, just as cameras are generally getting better at automatically gauging the right exposure, focus, and other settings. No, but I think it's for more people than use it today. If you're just uploading photos of your smiling friends to Facebook, chances are the core value of the image easily transcends a little pesky noise or skewed colors. Robert Balousek, from the San Francisco Bay Area, shoots raw—but mostly because Adobe Lightroom corrects some defective pixels in his SLR image sensor. "Auto-fix is a gamble," he said. "I don't apply it to all photos, just ones that I would like to use but are a little off. Sometimes it does what I want, but more often than not I tweak a few knobs until it looks how I expect. I don't claim to be an expert, I just know what seems right to me." If you're a bit more serious, though raw could be worth sampling. Give it a serious thought if you're an experimental students, a tourist who wants to compile memories in a photo book, a photo enthusiast sharing shots on Flickr, or a parent printing poster-size prints of your children. I believe software will ease today's manual pains of handling raw photos. Aperture and Lightroom have made it easier to process large numbers of shots, though there's plenty of work to be done. Automatic adjustments will steadily improve, and perhaps Windows will get the better built-in support Mac OS X has so people looking at a folder full of raw files see thumbnail images rather than a list of filenames with generic icons. It's true raw shots take up more space on your flash card, hard drive, and backups. But storage is cheap these days with 1.5 terabyte hard drives costing less than $100 and 8GB SD memory cards costing about $20. Today's large image files will look gradually more ordinary as storage technology gets roomier. One big change that could help raw catch on is standardization of the file formats. Today's profusion of formats ensures that operating systems or editing software have a hard time keeping up. The most promising avenue here is Adobe's Digital Negative format, which the company controlled for years but more has submitted to the International Organization for Standardization (ISO) as a proposed standard. DNG has been improved to address a number of earlier shortcomings, for example by adding profiles that can mirror camera tonal settings such as neutral, landscape, or portrait. Another more recent example are "opcodes" that can register lens settings used to so software can automatically correct optical problems such as vignetting or barrel distortion. DNG already could gracefully accommodate metadata such as copyright notices or editing instructions, and it for those worried about how well a specific raw format is converted into a generic format, the DNG can house the original raw file, too. Pentax is the most prominent company to build DNG support into its cameras, but SLR leaders Nikon and Canon still don't. Hogarty hopes the standardization process will improve its prospects. "I believe the gating factor in camera manufacturer adoption is the fact it is a format controlled by Adobe," Hogarty said. "Clearly it's not available in the majority of cameras shipped in the world today. That's why we're pursuing the ISO standard, so other companies can feel comfortable with the standard format." "If you look at images shot by the mainstream market, they need the most latitude in editing and correction capabilities. They're not as passionate about getting the perfect image," Hogarty said. "I think they'd be able to take that raw product to a finished product that would make them happier." I suspect it'll be a long time before raw processing is simple enough that mainstream snapshooters will embrace raw. But the trajectory is clear: the technology is improving. So if you care about your shots and have a camera that'll do it, set it to shoot raw+JPEG next time you're photographing something important. You may not want to mess with the raw shots today, but why curtail your options if you don't have to?